Leggings are one of the most comfortable and wearable staples in your wardrobe. You can wear them to the gym, out running or walking, at yoga classes, out for date night or drinks with the girls, or when you’re curled up at home after a long day. They are incredibly versatile, and if you find the right pair, they will last for a long time. Because they are so popular, you can find leggings almost everywhere. But how do you know whether they are going to be comfortable and hard wearing? And which leggings should you buy for each activity? We’ve taken the guesswork out of finding your next pair in this post. We’ve rounded up the very best leggings available today – so you can have it all, and have it delivered! When it comes to leggings for yoga, you need a pair that is as flexible as you are. Whether you’re new to yoga or practically a professional, you’ll also need to know they won’t roll down. There’s nothing that spoils your flow more than feeling like you have to pull up your leggings (or pull down your top) when you’re in the middle of downward-facing dog, backbends, or inversions (headstand or shoulder stand). The ideal yoga legging therefore has plenty of stretch, a high rise, and a supportive waistband that won’t roll down. In other words: you need leggings with none of the restrictions of regular pants! With over 4,000 Amazon reviews, 90 Degree by Reflex Leggings are some of most tried and tested on the market. In fact, they are so popular that the brand added packs of 2 and 3. Available in 33 different colors, there is something to suit everyone – from classic black, every shade of grey from dark to light, heathered colors, bright blue, dark blue, and lots of shades of pink. The double pack allows you to try two different colors in the same purchase, one classic black and one in another color. The triple pack is only available in black, but let’s face it – it’s the most practical and versatile color of all! These are some of the most affordable yoga leggings on Amazon, and buying a pack of two or three means that you save even more on the cost per pair. 90 Degree by Reflex leggings feature a wide, high-rise waistband that acts as shape wear. The higher waist and stretchy material help you to feel comfortable and confident when you are practicing yoga, whatever your size. And speaking of size, these leggings are available in sizes XS to XL (in other words, US sizes 0-18). In terms of fabric, these leggings are made of 90 Degree by Reflex’s signature ReBound Basic material, which is a mix of Nylon, Polyester and Spandex. They should be washed on a cool setting and laid flat to dry (never dried in the machine). They are designed to wick away moisture and have four-way stretch for support and compression. In terms of flexibility, they have a gusset crotch to maximize free movement and interlocking seams to minimize rubbing and chafing. These leggings are a great option: affordable, available in many colors, high waisted, and are backed with a 30-day no-questions-asked money back guarantee. If you LOVE the sound of these leggings but full length isn’t for you, the great news is that they are also available in a capri length! CompressionZ High Waisted Leggings are deliberately designed to provide maximum support and boost your performance. Imagine wearing a pair of compression socks – the kind you might put on when you’re flying long haul – but on your whole leg! Compression leggings aren’t just for people with DVT issues, they have many benefits. Compression restricts excessive muscle motion, conserving your energy levels, and helping you “go” for longer. Better circulation also helps you to recover faster. These leggings would work best for you if you like combining your yoga practice with other activities, including running, walking, cycling, or going to the gym – because you could wear them to do it all. They have a back zipped pocket that holds keys, credit cards, or a small phone – though you’d probably want to remove all of those things during yoga practice or your well-earned Savasana might not be as restful as you’d hoped! Their tight, snug fit supports your whole lower body, acting like a “circulatory pump” for your thighs and glutes and boosting your performance. Available in 11 different colors and patterns, these aren’t leggings for the shy and retiring yogi! Though they are available in classic black, the other designs include grey camouflage, pink florals, pale ferns, and blue leopard print. They are available in sizes XS-XL, but make sure you check the options before ordering as each size has a range of waist measurements. I’d always recommend sizing up if you are between two sizes to ensure a comfortable fit and make you feel your most confident. As well as the benefits of compression and circulation, these leggings have some great features to support your yoga practice. The fabric has four-way stretch to ensure that you are comfortable and supported while you are in poses that demand flexibility. Comfort is key, so CompressionZ promise no itching, irritation or chafing, and a material that wicks away sweat. This is important as it not only keeps you dry, but also prevents the build up of bacteria or odor in your activewear. Again, these leggings are made of a mix of Polyester and Spandex, and should be washed cold and dried flat. CompressionZ does promise that they will maintain their shape – even after several washes. CompressionZ wants you to love their leggings so offer a 100% money-back guarantee, which is great. These are definitely a good, affordable option if you are looking for a stand-out pair of leggings that will work for yoga and other activities besides. An Amazon bestseller, the ODODOS High Waist Out Pocket Yoga Pants are available in over 35 different colors, lengths, and finishes. There’s definitely something for everyone! Whether you’re looking for classic black, white, brights, heathered/spacedye colors, capri or full length, you’ll find something to suit you. Even better, these leggings claim to be made of “non see-through” fabric, so you don’t have to worry about your VPL in downward facing dog. ODODOS leggings run in sizes from Small to XXL. As with the previous pair, the ODODOS leggings can be worn for running, the gym and other exercises as well as yoga. However, it is important to remember that the fabric they use was actually created for yoga, so these leggings tick all of the boxes. The fabric contains four-way stretch to allow flexibility, and is supported by flatlock stitching. Flatlock is identified by a band of interlocked thread on both sides of the pants, sometimes in contrasting thread color for visual effect. Most importantly, this type of stitching creates a flat, comfortable, and flexible seam that means your leggings can stretch and flex as far as you can. In addition to the four-way stretch and flatlock seams, these leggings also have a specially constructed crotch gusset. The fabric also means these leggings are sweat wicking, as well as being anti-microbial. Less sweat absorption means less bacteria and less odor. Last but no means least, the ODODOS leggings feature a handy pocket on the outside of each thigh. The pocket is big enough to hold your phone or music player, keys or credit card. This is a great feature when you’re on the way to yoga (as you don’t always want to take your purse to the studio!) but I’d recommend taking everything out when you get there! If you’re looking for variety, this is a great option. Though there aren’t lower prices if you buy two or three pairs, these leggings are affordable enough to buy a couple of different options (capri, full length, bright or dark). There are more than 4,500 reviews on Amazon and an average of 4.2 stars, so there are plenty more reviews to help you decide if these are the leggings for you! Technically they’re leggings, but when it comes to buying the right gear for running, you’ll see leggings listed as “running tights.” That’s because runners and yogis need different things from their leggings. If you thought all leggings were created equal, you’re about to find out how different they really are! Running tights are “performance” wear. Typically, running tights are supportive, warm, and have a zipped pocket to store your cash, phone, or keys. 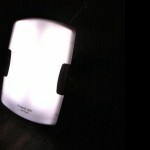 They might even have reflective logos, stripes or panels that help you to be seen on roads and trails at night. The most important difference is that running tights keep you warm and comfortable. When your muscles are warm, you are less likely to suffer an injury. But you’re also likely to be outside running in all weathers, so keeping warm (and dry) is a practical thing, too. As technical garments, you can expect to pay a little more for running tights that your basic leggings for all activities. But, cared for properly (washed cold, laid flat to dry) they will be your faithful running companion for years to come. Nike have been making technical clothing for sports since 1964. As the world’s largest supplier of athletic shoes and clothing, they’ve come to know a thing or two about what you need from your active clothing. Their Essential Dri-Fit Tights are an example of simple, classic design that gives runners the support and comfort they need to perform at their best. Made of Nike Power fabric – 92% Polyester, 8% Spandex – these running tights provide great stretch and support. They move with you and offer light compression to restrict excessive muscle motion, conserve your energy levels on long runs, and help you to recover faster. As well as light compression, Dri-Fit technology keeps you feeling dry and comfortable, even when you’re sweating. Nike offers an impressive range of sizes in their Dri-Fit tights. As well as sizes XS to XXL, there are different lengths: regular, short, and long. This helps you to find the best fit for you depending on your height, weight, and requirements. Where some people might prefer a longer length that bunches at the ankle for extra warmth and support, others prefer a shorter running tight. It all comes down to personal preference, but Nike has all the options covered. There’s even a crop length available if that is more your style! Compared to some of the yoga leggings we’ve looked at, Nike offers relatively few different colors. However, there are still some nice options: classic black, black with a neon waistband (ideal for night-time runners), burgundy, and dark blue. Each pair has a wide, elastic waistband with a drawcord – which helps you to customize your fit, tighten or loosen them depending on how you want them to fit. Everything about these running tights is geared towards comfort: from the soft fabric to the adjustable waistband. They also feature a flat seam construction that moves smoothly against the skin and prevents irritation, which is essential if you run long distances. Though they don’t include reflective stripes to aid visibility in the dark, there is a hidden zippered pocket at the back to provide secure storage for your keys, cash, or even your phone. Another well-known sportswear brand, ASICS isn’t quite as long-established as Nike, but still has a great reputation for producing high-quality performance goods. This name of this Japanese company is an acronym for the Latin phrase anima sana in corpore sano, which translates as “healthy soul in a healthy body.” The ASICS Women’s Thermopolis Tights are another fantastic option for runners looking for high quality running gear. Like the previous pair, these ASICS tights are made of 92% Polyester and 8% Spandex for comfortable support and light compression. However, the fabric is a soft brushed finish to provide comfort in all weathers and enhanced warmth. If you love running in the cooler fall and winter seasons, these are definitely the tights for you! The wide, contoured waistband is not adjustable but does have a water-resistant back pocket to keep your valuables safe and dry. Available in sizes XS to XL, there are standard and “tall” length options available. The “tall” length is ideal for you taller gals as it adds an additional 2 inches of length to the standard ASICS tight. As always, check the inseam details listed by the company before purchasing so you can work out what the best fit for you is. These ASICS tights are actually part of Amazon’s Prime Wardrobe initiative, which offers a “try before you buy” service. You get to try them and get the sizing right before you commit to the purchase – and if it doesn’t work out, there are free returns for 7 days. ASICS thermopolis tights are available in three colors – performance black, dark grey heather and black (which has black panels at the waistband and down the legs) and dark grey heather. Though there are lots of options, these are three great basics that will match the rest of your running gear. These are definitely the best option if you’re looking for running tights that keep you warm and cozy! 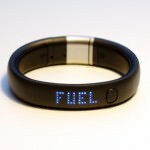 The other two options are great, but if you’re a serious runner you need something that will perform as well as you do. If this sounds like you, then CW-X Mid Rise StabilityX Compression Tights are the ones for you. There is some serious technology behind these tights, created and refined with the goal of helping athletes improve their speed, endurance, and recovery. CW-Z products are made with EXO-WEB Technology that works to mimic kinesiology taping designs and patterns, offering targeted support for your joints and muscles while you exercise. Kinesiology-taping is an extremely efficient and targeted way of dealing with injured joints and muscles when applied by professional trainers. CW-X tights provide optimum support for hip joints, the pelvis, knee joints, calf muscles while also offering the benefits of compression – restricting excessive muscle motion, conserving energy levels on long runs, increasing circulation and promoting fast recovery. The tights feature specially designed panels to provide support to the knees, while the fabric (80% Coolmax, 20% Lycra) has four-way stretch and wicks away sweat. Designed for hot days and cool days, these running tights will keep you warm and comfortable, or cool and dry. The fabric also provides the best protection against UVA/UVB rays, as the fabric has a rating of UPF 50+. As well as performance, these running tights are geared towards comfort – even across long distances. Fabric panels are joined together using a flat seam construction that works to eliminate abrasion, increase comfort and enhance fit. As the CW-X tights contain panels that support your joints and muscles, they must be put on correctly (especially at the knee) to provide optimum support. That means getting the right size is really important. Available in 8 colors, the sizing runs from XS to XL – however, there aren’t any additional length options. Looked after properly, these running tights are an investment that could last for a long time. Wash cold, dry flat and never put them in the dryer. Unlike the other running tights we’ve looked at, these feature a reflective flash on the back of each leg to ensure maximum visibility when you’re out running on trails and pavements in the dark. Though these running tights are at the pricier end of the spectrum, they are a must-have for serious runners who want to boost their performance while staying as safe and comfortable as possible. 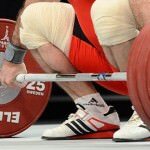 Those with previous injuries to the joints or muscles of the leg would also benefit from the technology that has gone into making these the best on the market. 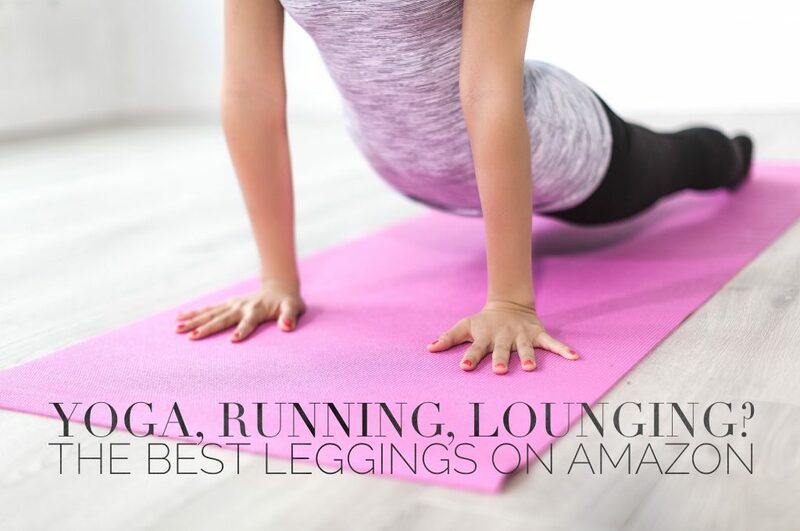 I created this category because I wanted to recognize that leggings are a great wardrobe staple, even if you aren’t into yoga classes or running. Whatever the technology behind it, pretty much every pair we’ve looked at so far would be a comfortable option for hitting the gym, a spin class, hiking, or just taking the dog out for a walk. But that isn’t the end of the versatility of leggings. One of the year’s biggest trends are faux leather or “leather look” leggings. Without a doubt, established shapewear brand SPANX make the very best. With 300+ Amazon reviews and love pouring in from every direction, these are the pair to buy if you want to add something flirty, fun, and fashionable to your wardrobe this season. SPANX Ready-to-Wow Faux Leather Leggings have built in slimming to smooth and shape your silhouette. They also feature a wide, relatively high waistband that is backed with “power mesh” to provide extra support to your tummy and waist. Unlike standard leather pants, these leggings are made of fabric that has been treated to create a faux leather finish, which makes them easy to take care of. Rather than dry cleaning, they can be machine washed on cold and laid flat until they are dry. Available in regular (XS – XL) and plus sizes, SPANX caters to every woman in order to help her feel confident and amazing. Certain sizes also offer regular and longer length legs for you tall gals. There are 5 different colors including black, navy, wine, antique rose, and bronze. It’s great to have a couple of more casual options (like wine and navy) alongside the dressier black. In terms of fabric composition, these leggings are made up of 80% Nylon and 20% Spandex (the power mesh is 87% Nylon and 13% Spandex). This gives them a good amount of stretch, but not enough that they become loose at the knees or waist after wearing. Though it can feel frivolous spending on wardrobe additions that reflect current trends, I’ve got a feeling that leather-look leggings will be around for a quite a while yet. These black leggings with a silk shirt and heels for date night or drinks with the girls, or the wine color with a fuzzy sweater and boots are definitely on my “to wear” list for the fall. It’s nice to be able to pull on a pair of leggings that give you a great shape, but when we’re at home there’s one thing that matters above all else: comfort. Vanilla Night & Day are a European brand that specializes in super soft loungewear, and their leggings are no exception. Made of 93% viscose and 7% elastane, these leggings are some of the softest on the market. Their low stretch-content means that they aren’t going to offer shaping and smoothing the way that the other leggings we’ve looked at do, but that’s what makes them so perfect for lounging around the house. The lightly elasticated waistband hits just below your natural waist for a comfortable, flattering fit. Perfect for cooler days when you want to be cozy, these leggings are light enough to be worn on warm days too. They are even thin enough to act as thermals! Available in sizes XS to XL, you can choose from black, navy or grey. Vanilla Night & Day also sell separates, meaning you can find a super soft and cozy top to match your leggings for ultimate lounging. As you’d expect, these super soft leggings can be machine washed on cold and hung up to dry (do not put in the dryer). These are definitely a good option if you’re looking for a cozy pair of leggings that prioritize comfort over shaping. The comfortable waistband and soft material make them a perfect choice for the holidays – whether it’s Thanksgiving or Christmas. Though still an affordable price, it’s worth noting that these leggings are made by hand meaning that you get a high quality finish that will last. I hope you’ve enjoyed this round-up of the best leggings on Amazon! Whatever you’re wearing them for, have fun and be comfortable. And remember, a woman can never have too many pairs of a good thing.